These are every bit as good as they look. Better, maybe. Are these the ultimate sugary midnight snack? Maybe… although when I ate them it was actually more like 9:30pm. I really had made them for the next day but, sadly, they didn’t survive. I just couldn’t wait, and when I started I couldn’t stop. I refuse to tell you how many of these I ate. I’m a little embarrassed. So much for will power. melted into a wonderful goo. 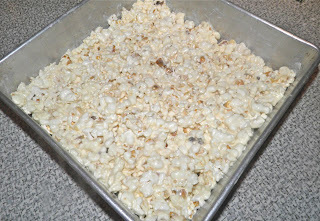 These are a twist on the old “Rice Krispie Squares” recipe so many of us love. 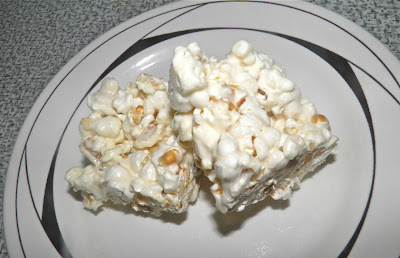 They are absolutely every bit as tasty made with popcorn, and cheaper. And fast? Extremely fast if you use the microwave method I have written out in the recipe. Did you know you can pop corn kernels in the microwave just in a brown paper lunch bag? Place 1/4 cup at a time in the bag, set the microwave on high and set the timer for 3 minutes. Stand in front and listen. When the popping dies down stop cooking and remove. That’s usually around 2 minutes. But every microwave is different – so listen to the sound. If you “nuke” too long the popcorn will burn. At this stage you have to work a little quickly. But clean-up isn’t that onerous. Marshmallows are essentially whipped sugar so hot water and a little soap cleans all your dishes in a flash. Many recipes online have overly involved directions for using waxed paper and such to press the mixture down into the pan. I find a little margarine on the hands worked beautifully. 1. Pop your own popcorn. It will have no salt and no oil. Both are important as some packaged microwave popcorns use hydrogenated and/or coconut oils. Both contain trans-fats – a dietary no-no. Even plain old Orville Reddenbacher’s Tender White Regular contains 20% of your daily allowance of fats. No trans-fats though, thank goodness. 2. You can substitute butter, but… If you substitute the margarine for butter (which seems like a good idea) you will not get as “soft” an end product. The butter stiffens them up a bit. But that’s your choice. Now, on to the marshmallows!!! Prepare a 8x8 or similar pan by liberally greasing with margarine and lining with a piece of waxed paper. Pop the popcorn and place in a large bowl. Squeeze it a few times to *slightly* break up the popcorn. This helps make a more regular mass when pressed into the pan. 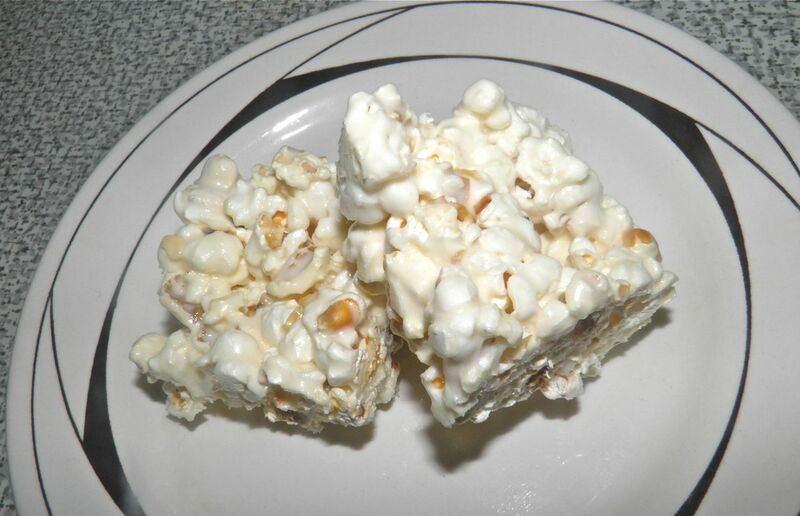 Microwave the margarine and marshmallows together for 2 minutes. Then take it out and stir. If the marshmallows are melted, add the vanilla. If they’re not melted, microwave for a further 30 seconds – then add the vanilla. Pour the melted marshmallow mixture over the popcorn and stir well until mixed together. 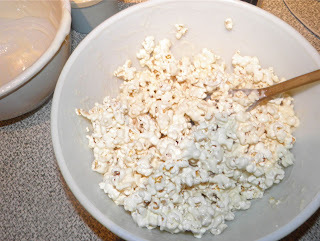 Quickly turn the popcorn out into the pan. 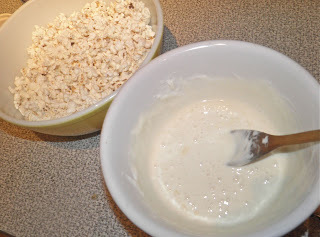 Grease your hands with margarine and flatten the mixture, making sure to get it as uniform as possible. Let sit until cooled and/or refrigerate. Cut into 2” squares and serve!